Maria Zavala’s electric meter on her new solar powered home in Madera may run backwards on sunny days. After tragedy, solar answers a family’s prayers. Maria Zavala has very long, wavy hair that hangs down to the middle of her back, past her elbows. She stands in her new driveway in the bright Central Valley sun cuddling a happy gray kitten named Myla, who likes to chase lizards. She’s watching as her 20-year-old son, Nicolas Rangel, and a crew of installers slide blue solar panels out of the back of a white truck and hoist them up on her roof one by one. The installation is the culmination of a process that has changed both of their lives. Maria feels this home and the solar panels are a blessing that came from her prayers, but it’s bittersweet. She had planned to live here with her husband—father to her stepdaughter, 18-year-old Erika, who attends nearby Madera Community College. She remembers a flier kept appearing in her life over and over until she finally called the number on it. The flier advertised a program from Self Help Enterprises that allows low-income individuals in the San Joaquin Valley to use their “sweat equity” as the down payment on a home. She qualified, but just before construction began, her husband was diagnosed with a fast-moving cancer in July 2013 and died that October. But she carried on with her plans to build the new home. “My mother, my sister, my sons—all were here helping. I got ill and I couldn’t come out to work on the home but the neighbors and Geraldo next door helped out a lot,” she recalls. Maria and Erika moved from their small apartment into this new home—modest but comfortable—in Madera’s Park neighborhood on August 11. Then, suddenly, at the end of August Maria’s sister had an aneurysm. She had surgery and then was in a coma until she passed away September 11. “I was hoping she would come visit my house and have a housewarming party,” Maria confesses, still raw with the loss. 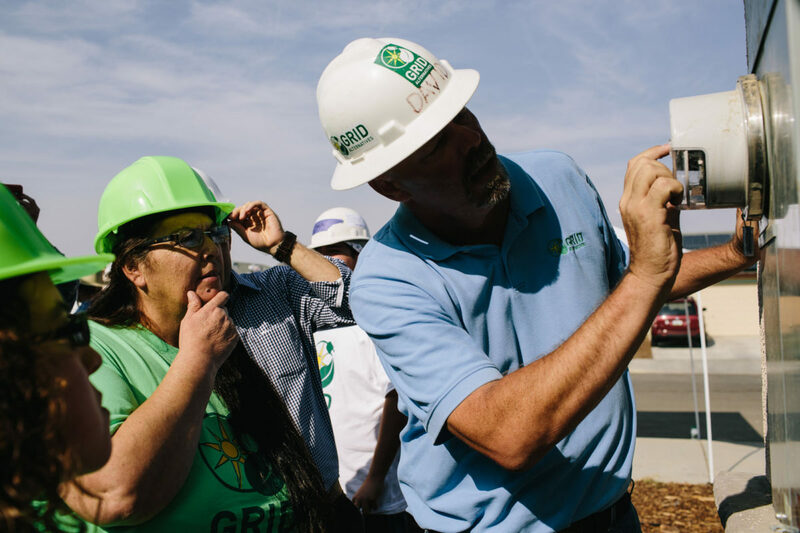 After she and Erika moved in, Self Help connected her with GRID Alternatives, a national nonprofit that provides job training in solar installation and no- to very-low-cost solar for qualified homeowners. She met the relatively strict criteria to receive the panels. Maria is among eight families receiving solar during this week as part of a GRID Alternatives Central Valley Solarthon event, bringing to 29 the total number of families in this affordable housing community to receive solar. California’s climate justice and clean energy laws have increased the funding available for programs like this, and as a result, more families like Maria’s are now saving money with clean power. It’s serious money. Her PG&E bill at her old apartment was $200 a month. It already dropped substantially because the homes that Self-Help Enterprises builds are highly energy efficient. And after she got her solar system, her electricity bill dropped as low as $1.50 for a whole month. “If I save on my electricity, I can get an Energy Star washer,” Maria says. She had wanted to get a washer when she moved in, but decided to get curtains first. “I had sheets on my windows,” she explains, pointing to the new curtains. The home, the curtains, and the lower energy bills don’t erase the losses, but they make the future more manageable. And for her son, Nic, helping Maria with the house may have helped him find a course for his future. 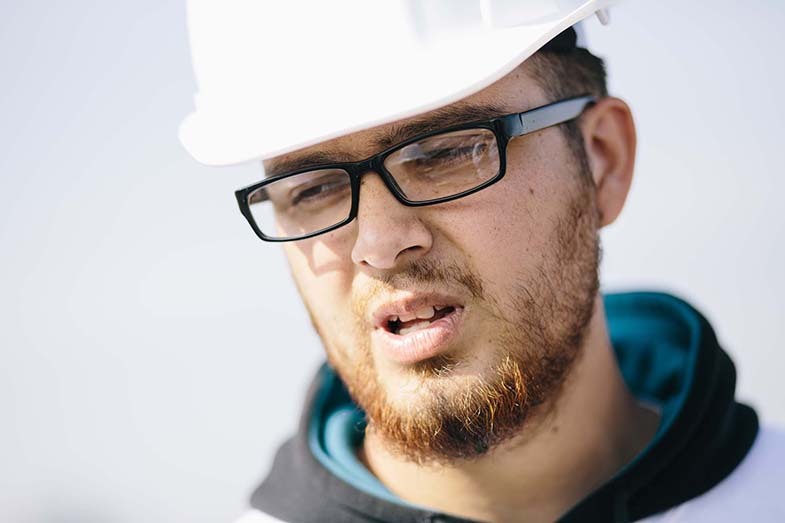 After volunteering with Grid Alternatives to install solar on homes in his neighborhood, 20-year-old Nic Rangel is considering a career in the solar industry. Solar came to their community when Nic was at a point in his life where he really wasn’t sure what path to take. He was looking for a job that pays better than minimum wage but couldn’t find one. One day he went to the Army recruiting office to sign up, but found the recruiter was only recruiting for Reserves. He thought about tracking down a regular recruiter but delayed because his mom needed help fulfilling her sweat equity part of her bargain for the housing program. “It was the hottest summer I’ve been part of,” he says, but he enjoyed working on the house. Then, solar caught his attention and he’s been volunteering with the installations in the neighborhood, including the system going on Maria’s home today. Job opportunities in the solar industry in California are increasing significantly, with 3,532 new jobs in solar added in one year, according to a 2013 study by the Solar Foundation. This job growth is a direct result of the California Solar Initiative and California’s climate and clean energy laws. Job training in low-income communities like this Madera neighborhood is an integral part of SASH (California’s Single Family Affordable Solar Homes program), which is administered by GRID Alternatives specifically to benefit people like Nic. “He wants to go through the [solar installation] training and he might take a little turn now. He’s gotten really interested in learning how to do solar and he’s been talking to the supervisors about it,” Maria said proudly. 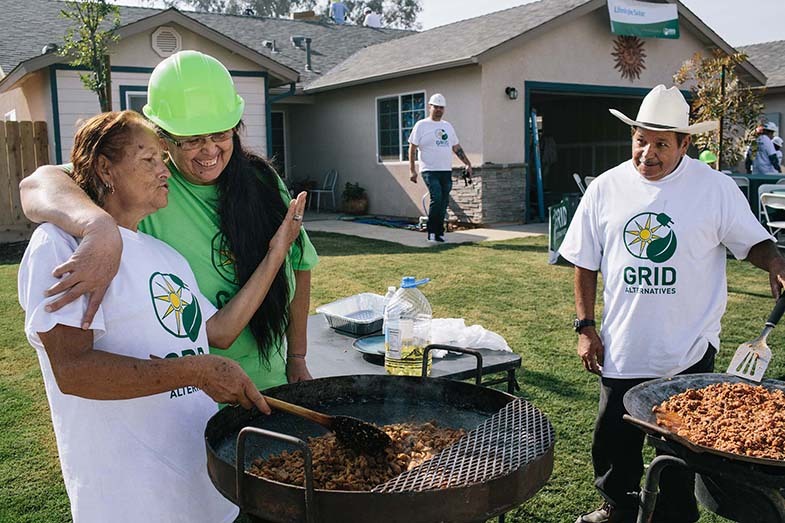 Maria Zavala and her neighbors Maria Alejandre and Gerardo Ramirez make homemade tortillas and grilled meats for the crew installing solar in their Madera neighborhood.